A lot of anti-spam products rely on filters and other rule-based technologies, but spammers work every day to get around these filters. What works one day, doesn’t work the next. SPAMfighter uses a very different strategy. 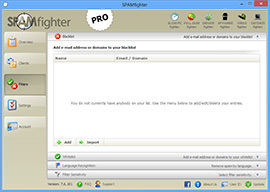 SPAMfighter harnesses the power of a very large community of people who instantly report any spam or phishing messages they receive. Once several people have reported the same email, it is automatically filtered for the rest of the community. In this way, very few people in the community will ever see the spam or phishing email. In addition, a lot of spam and phishing emails are filtered out before they ever reach the community, but the way we do that is secret and not something we will give away. The spammers might be reading about us as well ;-). If you use SPAMfighter, you will stop receiving spam instantly, and if by chance you do receive a spam message, you get the satisfaction of reporting it and removing it for all other community members with a single click. Join the more than 3.7 million SPAMfighters across the globe that have a clean inbox. SPAMfighter is currently available in English, German, French, Spanish, Portuguese, Chinese, Japanese, Russian, Swedish, Norwegian, Dutch, Italian, Greek, Suomi, Bulgarian, and Danish. 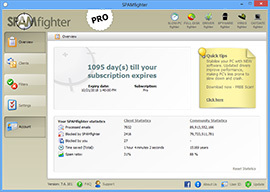 You get SPAMfighter Pro one month for free. 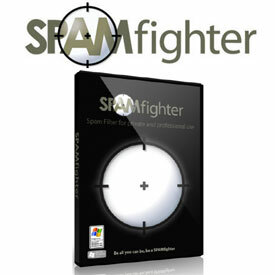 After that you automatically get the 100% free SPAMfighter Standard for private use as long as you want.